For the past 14 years Sonic Bloom has the power to pull together astounding people with the drive to live a conscience lifestyle. The underground music this Colorado festival offers hits the right frequencies that activate new thinking. On the Hummingbird Ranch overlooking the beautiful Spanish Peaks, the energy is vibrant, creating an intimate experience unlike any other within the electronic music scene. Get a glimpse of the Unified Field by enjoying the Sonic Bloom 2018 recap. To help explore the lineup Sonic Bloom created a festival playlist. For the first time ever Gramatik will bring his massive production and sound to Sonic Bloom, giving us plenty to look forward to. Also, a legendary house music producer and the founder of mushroom jazz during the original house movement in Chicago, Mark Farina is a set not to be missed. Then Kalya Scintilla offers us his special experience with Eve Olution that will really epitomize that Sonic Bloom spirit. 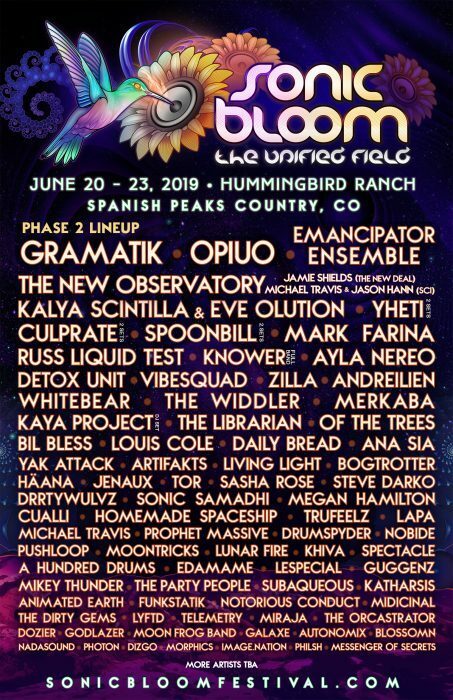 More enticing artists full of reverberating bass, mystical melodies, enlightening sounds, jam bands and funkadelic grooves include OPIUO, Emancipator Ensemble, The New Observatory, Yheti (2 sets), Culprate (2 sets), Spoonbill (2 sets), Russ Liquid Test, KNOWER (full band), Ayla Nereo, Detox Unit, VibeSquaD, ZILLA, Andreilien, Whitebear, The Widdler, MerKaBa, Kaya Project, The Librarian, Of The Trees, BIL BLESS, Louis Cole, Daily Bread and Ana Sia. The ideal festival for those looking for something different, SONIC BLOOM is a unique foray into intelligent co-creative experience. Thought provoking workshops hosted by internationally acclaimed speakers, a diverse range of yoga and movement workshops, overflowing visual art and unique vendors provide a little something for everyone. Insurmountable obstacles that Jamie Janover and the curators of Sonic Bloom face include a regulation that prevents booking artists that play Red Rocks Amphitheater during the summer. This year they did a great job pulling together a lineup that will bring the right people and vibrations to create a truly transformational experience. Get involved with the community by volunteering, performing or becoming an official ambassador with amazing perks. Stay tune for more announcements.